+ Pick up The Working Stiff: Season One in Print! 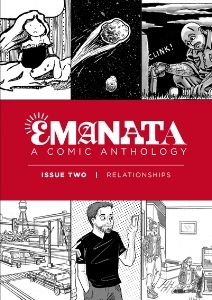 Emanata is a biannual comic anthology featuring a collection of independent cartoonists. Each issue is made up of self-contained stories connected by a common theme. In addition to contributing to each issue, I also serve as series co-editor with Felix Quinonez Jr.
Subjective is a collection of the 'comic poems' I co-created with Matthew Bernard. It contains work initially featured as part of Emanata 1–4. The fifth and final piece is a new exclusive comic poem created specifically for this collection. Each poem is inspired by a theme and muses on a philosophical aspect of life. As the creator of The Working Stiff, I draw a lot of zombies doing very unzombie-like things. So every year, when #Inktober rolls around it only makes sense that I draw more zombies doing more unzombie-like things. After the last couple years, I have build up a modest collection of comics, illustrations and character designs based on the official inktober prompt list. Presented here are the best pieces from that collection in no particular order. "Show and Tell" is a limited edition comic I published to promote my work. It features a collection of stories originally published in Emanata as well as a sample of The Working Stiff. It's currently out of print, but you can read the comic in its entirety by clicking the link below. Stories Included: "The Cover Up," "Always Connected" and "His Own Worse Enemy."